During this time of the year, I know pumpkins and apples are king. However, I always start getting tired of those flavors by the time the end of November rolls around and start dreaming of new dessert combinations. 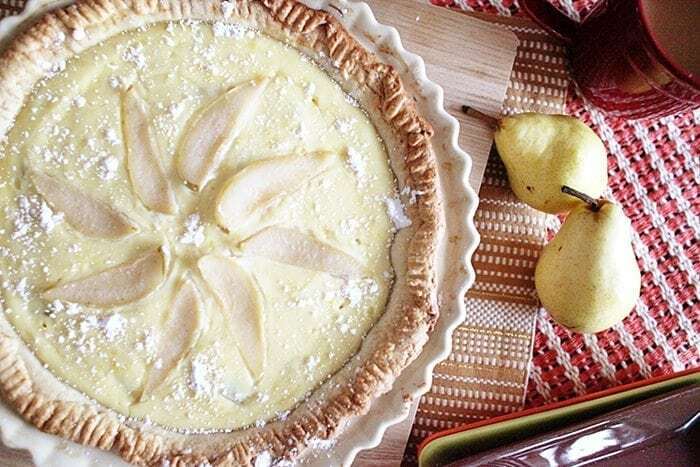 Enter the pear and this creamy, lights Ricotta & Pear Pie. We love pears in our house and I often think that the pear is a forgotten fruit. Sometimes you can find it mixed into a topping for a pork chop, or as part of a dessert, but really it doesn’t get to be the star fruit often. Apple and pumpkin certainly take center stage in the fall but baking with pears is a nice departure from the norm and your creations can be just as sweet and delicious. That said, I didn’t plan to make this pie. I had planned to make a cake. However, at the last minute I changed my mind. I’m totally a pie person and since I had just made a pumpkin cake, my desire for a creamy, delicious pie won out. This Ricotta & Pear Pie is really the perfect afternoon treat or great for a relaxing evening after dinner. It isn’t overly sweet. Instead the cheese makes it just sweet enough to enjoy with a nice cup of coffee and you sit back after a long day and savor all the good moments. The fruit and the cheese complement each other too. While this recipe has sugar in it, it’s just enough to product subtle notes of sweet and really lets the texture and other flavors shine. Get the full recipe below! 1. Preheat your over to 350 degrees. 2. Add the seasoning ingredients to a large pot with 5 cups of water for the pears. Once it is heated through to the proper temperature, add your cut pears. Water should be kept at a consistent temperature and the pears should be fully submerged. You don’t want it to boil like a pot of water so leaving them to simmer is a good way to make sure the water doesn’t get too hot. Leave them to cook for about 20 minutes while you make the dough. You can use any ingredients in the water you think will make the fruit more flavorful. I used the ones noted above. 3. For the pie crust, combine all of your dry ingredients and mix thoroughly. 4. Add your butter, eggs and sour cream and mix well until there are no lumps and the ingredients are well combined. 5. Chill your dough for about 30 minutes. 6. While the dough is chilling remove your pears from the water and make sure they are well drained. Cool the pears down by running cold water over them in a colander and/or adding them to the fridge. 7. For your filling, mix ricotta, sugar and eggs until everything is well combined. Add your lemon zest and vanilla until the filling is smooth. 8. Roll your dough out and place it in the pie dish. Form the sides of the dish as desired and crimp with a fork. 9. Add your cubed pears and then pour the ricotta mixture over the tops of the pears. I hope you enjoy this, friends! Happy eating! For more dessert ideas, click here. I have never had ricotta in a dessert before other than stuffed inside a canoli. I am excited to try this pie! This looks delicious! I’m going to have to make this for my family this week. They will be so proud of me – haha. Thank you for the great idea!! This looks so beautiful and light! I love pears and I agree, they often get overlooked. Will be trying this one, thanks! This look simply divine! I am saving this for the holiday season for sure! Great idea to use pear! Love it! WOW! This sounds really great. I am not sure I would have ever thought to put Ricotta and pear together but by the looks of it, I NEED TO! I’ll admit: when I first read this, I thought, “This is crazy! Ricotta and pear?” I would try it though! I having a dozen pears arriving tomorrow and I have never ever thought to poach a fruit before. This is definitely something I’ll be trying! Sounds so delicious! I’d like to try this! It’s an unique desert, that’s sure to raise some eyebrows. I have to say I always thought there was more to ricotta than just in my pasta dishes LOL. I am really intrigued by this and would love to try it! Lovely! I don’t think I’ve had a pie like this before. The ricotta definitely gives this the right creaminess. I’m sure it tastes amazing!!! This looks amazing! I am planning on making something similar but I like your recipe better! Sometimes, it’s really good to try something different than the usual. 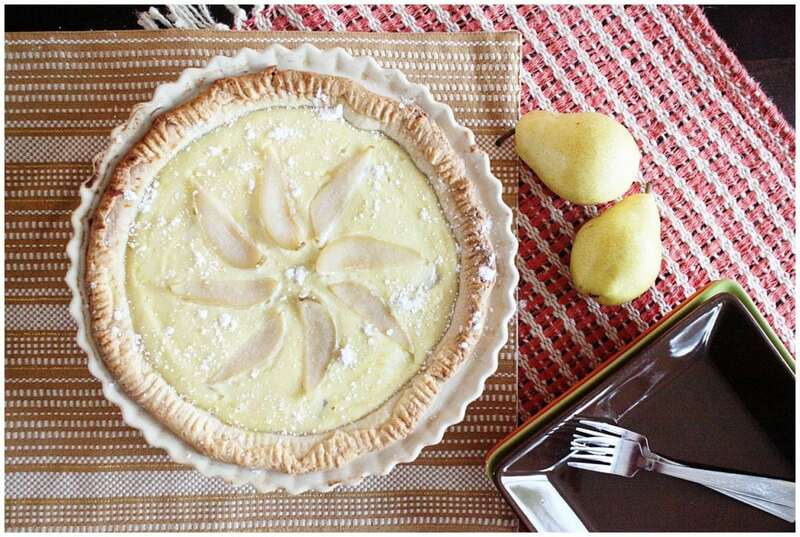 I love pears so I am sure that this pie is good! What a unique flavor combination! I love the way this looks and sounds! Yum, this looks so amazing! 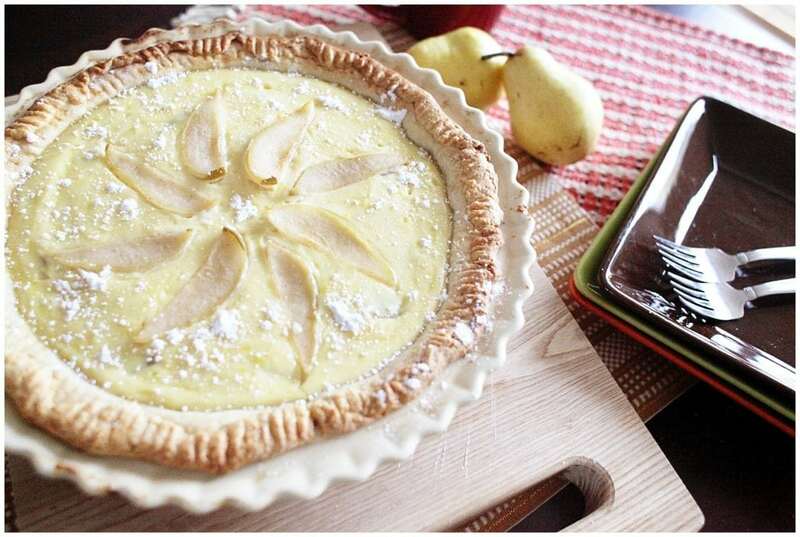 I am a huge fan of pear desserts and will definitely give this one a try! I pinned your recipe! I bet it tastes so good. I love the ricotta and pears combo! I need this in my life right now! I have never had a pear pie before! My mom use to make an amazing pear pie. It didn’t have cheese in it but I do love ricotta so adding it to my holiday dessert list. The two ingredients I never use! I usually don’t buy pairs as my go to fruit. And I definitely never use ricotta. Very interested to know how this tastes! Yum! This pie seems so finger-licking, Rachel. Easy, tasty, and quick, just everything I can ask from a recipe. Can I use honey instead of maple syrup for the filling? This looks delicious! Definitely not a combination I would have thought of but it sounds like it is the perfect pairing. Wow! This looks amazing. 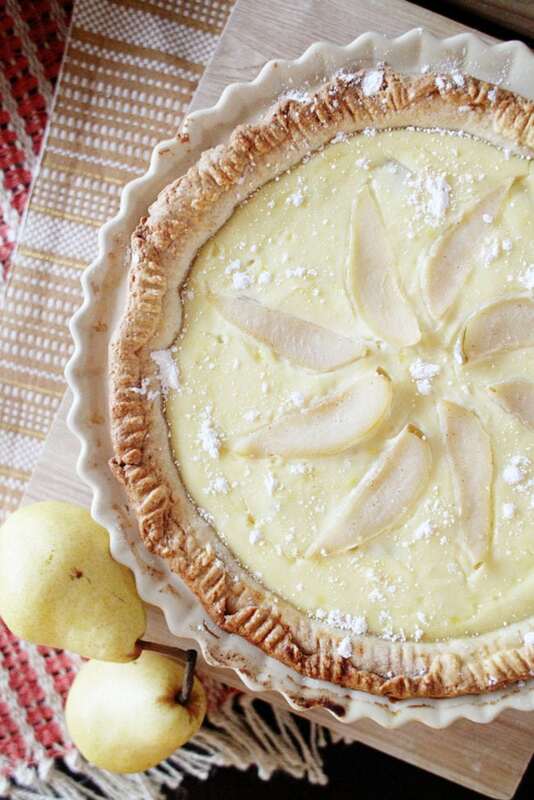 I’ve never had a pie with ricotta or pear so its something I’d love to give a try. It looks tasty and has me very curious! This is such an unexpected, unique pairing but definitely so intriguing! I want to try it now! Happy Thanksgiving! Not only does this sound like an amazing flavor combination but this pie is so beautiful! In my kitchen it’s usually either very pretty or tastes very yummy – mastering both is an art. I’m definitely trying this recipe! This is such a unique combination for a pie, I bet it is lovely.